On MayDay this year our local homeschool Girl Scout troop put on a May Fest for us. We had a grand time, it was a putluck lunch, and the girls got to make a flower garland for themselves, the boys could make and decorate a crown. Trev passed, of course. I did not! There was a maypole dance, and Teri sang this pagan song about faeries that I absolutely must learn. 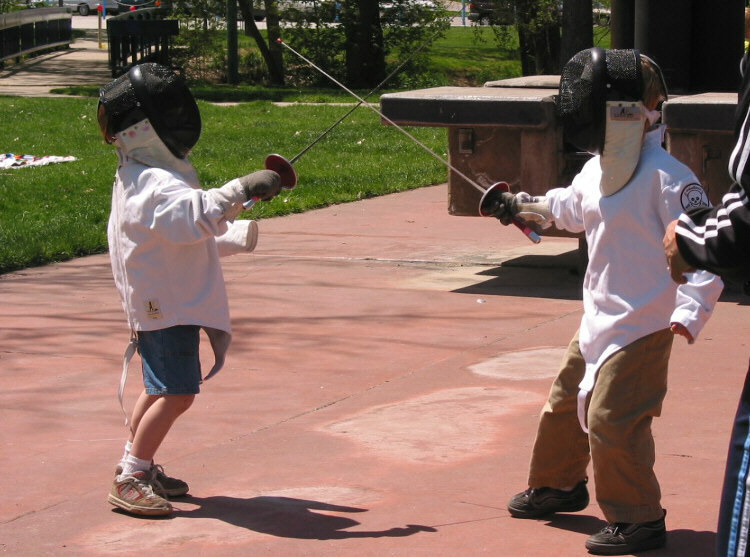 Trevelyn, my dear son, had the opportunity to don fencing gear , and have a bout with another boy. Ethan, was his name. When Trev asked the man if he could have a turn, I was a little unsure what might happen, would he slash and swoop like he does with sticks, hoses, and other sword-like paraphernalia, or would he be a bit shy or intimidated by the fancy gear, and mask? He was not extrememly aggressive, I can tell you that! I should have known, anytime he does something for the first time, he is exceedingly cautious, it's not until he is sure of himself that he goes all out. He is always enthusiastic before, he really expects that he shall excel at any given task - like before he went skiing with his daddy, he was sure he was going to be the fastest on the mountain, then much to his surprise, it was difficult, technical, and hard work. He found fencing to be much the same, also to his surprise. 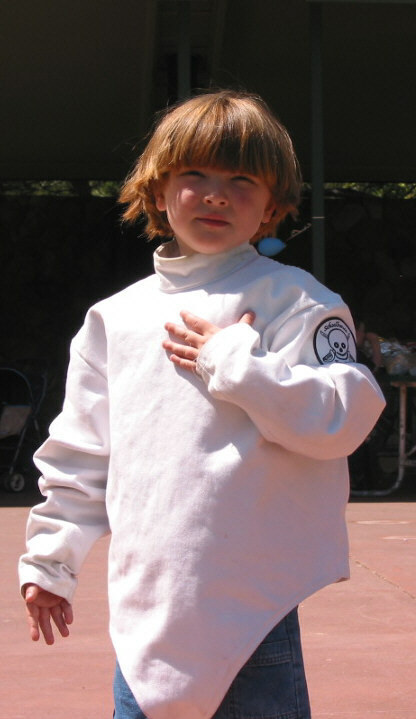 Just like after skiing, when it was all over, he said "oh...I wasn't a very good fencer." With much disappointment in his voice. Sweet little darling.